There’s a new buzzword in town and it’s set to take the business world by storm. ‘Gamification’ is the use of game based mechanics in non-game contexts. 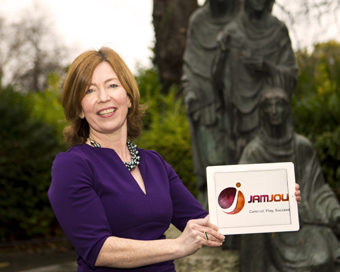 JamJou recently launched Ireland’s first application delivering training through game based real-life work scenarios. A cloud based system with no requirement for the installation of costly software, JamJou is one of the first training tools where management have real time access to staff skills assessment. JamJou uses interactive gaming features such as animated characters, scenarios, points, badges and leader boards to engage staff, which in turn improves performance. “So they’re getting instant feedback – as you go through the game scenarios you get points. While the leader board gives the social aspect, people can see how they’re doing against their colleagues” says Jo. As a former training consultant working with frontline staff in very target driven environments, Jo naturally used some element of games to engage people. Before setting up JamJou in 2014 she had dabbled in gaming with friends and through her two teenage boys. But it was only when she took a closer look at gamification that she became fascinated by the statistics around it as an engagement tool and around how many hours a day people played. Things came into play when she saw the data that could be collected from game users. “That was one of the things that I know organisations are challenged by. They have training solutions but they never see what the results are or what happens with it,” she says. To date there has been initial interest in JamJou primarily from the hospitality, retail and financial services sectors. One of the early adopters of the technology is PREM Group, specialists in managing hotels and serviced apartments. The group is using JamJou for customer service and sales training in Ireland, with a rollout to the UK and Belgium planned for later this year. It was through ‘mystery shopper’ audits that PREM Group saw the real behavioural changes in customer service, sales and product knowledge made since using JamJou. Jo is also in advanced discussions with a large retail financial services company so watch this space, she says. She hopes to capitalise on the rapidly growing gamification and eLearning markets, both set to grow by 37 percent and 23 percent respectively by 2020. She plans to grow the business to 11 employees over the next three years with expected revenues of €1.5 million, primarily from export. Her sights are far reaching toward the US and lucrative Asian markets, where smartphone usage is very high. Status: High Potential Start-Up with Enterprise Ireland. Structure: 3 employees – 2 techys and myself. Ambition: Rollout in UK and US market by 2015. Funding: Original personal funding of €100,000. Currently looking for Angel investment.